Santorini is one of the most beautiful places I’ve ever been. It’s an island located in the Aegean Sea. When you arrive in Santorini by cruise ship you have to tender in to port. Once in port there are three ways to get up to the town of Fira by cable car, donkey or by walking the 587 steps up the switchbacks. I usually opt to walk, but if you are not up for a strenuous walk you may opt for another option. Walking allows for an opportunity to take in the gorgeous views while getting a great workout! Last year, when I visited Santorini there were four large cruise ships in port on the same day. This really seemed like more than this small port could easily accommodate. The queue was so long for the cable cars and the donkeys that walking was actually the fastest way up to Fira. It took about 40 minutes. However, it was June and it was very hot and there were so many donkeys coming up and down the hill on the narrow pathway that it was quite uncomfortable. I literally thought that I was going to get kicked, stepped on or smashed in to the wall by a donkey on the way up. A woman near me on the path advised that I lean in to the wall and put my arms out, so the donkeys would avoid getting close enough to kick me or step on my feet. Once I got to the top of the hill and drank a cold bottle of water and took in the breathtaking views I forgot about all of the struggles to get up there. 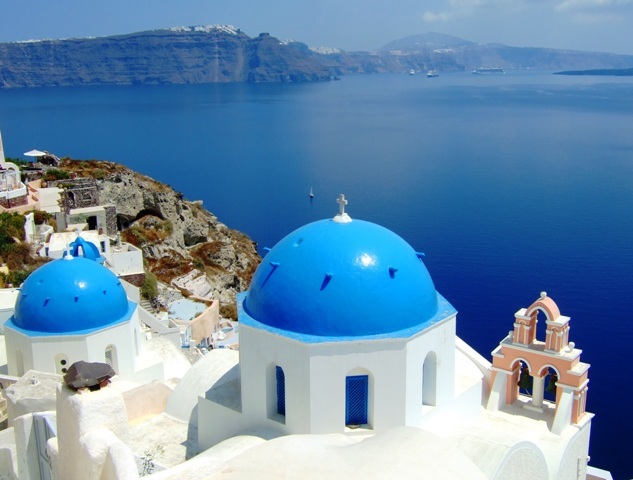 Fira, Santorini’s largest town, has beautiful views and lots of shops and cafes. It can get very busy when there are several ships in port, so we decided to take a bus to Oia which is located on the other side of the island in the northernmost point. Oia, is a small village and is even more picturesque and a little less crowded. We spent the day in Oia, winding around the cobblestone paths, shopping and taking photos of the whitewashed buildings, churches and the blue sea. There were several cafes to choose from for lunch, each with a view of the water and a traditional Greek menu.